Supplied and installed with or without sub-frames, our secondary glazing and double glazing are popular choices with our clients. A Room With A View, in Dorking, Surrey, offers lift-out, hinged, fixed, vertical and horizontal slider options. We also provide guttering systems and other roofline products. Call our friendly and helpful team today to discuss our range of secondary glazing and rooflines. At A Room With A View, we have an excellent range secondary glazing products, as well as a being a local supplier and installer of the Mustang seamless aluminium guttering system. Our aluminum secondary glazing is available with or without sub frames and in fixed, lift-out, horizontal slider and vertical slider options. Download our secondary glazing brochure. Only aluminium guttering system in the UK to have BBA approval. 90% of the aluminium used in the system comes from recycled sources and can be recycled again. Mustang guttering never fades or cracks in high- or low-temperature conditions. 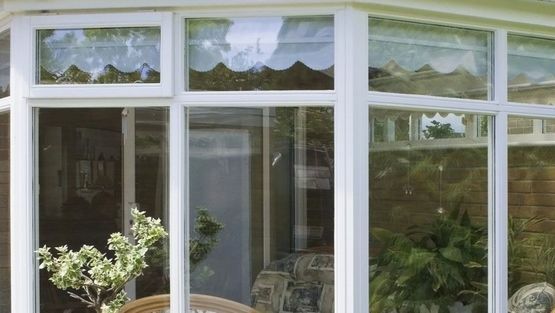 Uses polycarbonate locking fittings to eliminate leaks points, making it possible to create lengths of up to 30 metres. The installation includes concealed brackets to make guttering visually appealing. The shape allows for high-flow capacities when used on domestic applications. It comes in 4 standard scratch-resistant finishes: black, white, cream and brown. If required, guttering can be supplied in alternative colours at an additional cost. Fast fitting times make Mustang guttering easier for installers and their customers. Mustang guttering integrates with existing fascias or our own uPVC roofline products. Replacement or cladding of soffits, fascia and bargeboards. Due to their excellent functionality and low maintenance requirements, we use premium-quality PVCu roofline products. When cladding, we remove all rotted timber and replace it with treated and tanalised timber. We also then apply new cladding to protect the timber from the elements and future deterioration. Contact us now, in Dorking, Surrey, to receive more information about our secondary glazing and roofline products.